Taking advantage of the trend towards Mid Wheel Drive Power Wheelchairs, Bruno has designed an Out-Sider® specifically for these popular models. Taking advantage of the trend towards Mid Wheel Drive Power Wheelchairs, Bruno has designed an Out-Sider® specifically for these popular models. The unique feature of this lift, a significantly smaller platform, takes advantage of the MWD design of your chair which dramatically reduces the weight of the lift. 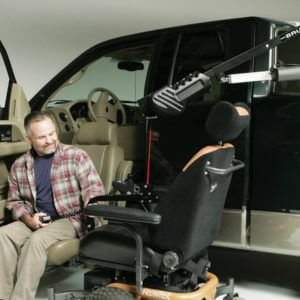 MobilityWorks’ factory certified technicians will adjust the platform to snuggly nest your wheelchair’s drive wheels in to the choke so as it rises, the Hold-Tite-Arm will secure it properly and safely.